A few years back, we took a long hard look at Tiger Sheds to see what kind of products they offered, how their prices were, what their customer service was like and so on. It’s now 2018 and we felt that it was time to go back to Tiger Sheds and see how things have changed over the last couple of years. One of the main reasons that we wanted to do this now was that we had heard a lot of work had been going on at Tiger Sheds to make them compete with some of the larger garden building retailers. We have spent a lot of time looking over their website, reading customer reviews and blogs in order to make sure that this Tiger Sheds Review is as fair as can be. We have not currently done a mystery shop with Tiger Sheds and all the opinions below represent an aggregation of those of other people we found online during the research for this retailer guide. We have done our best to collate all the information into one page with links to other sites in an attempt to help save our readers time. In the interests of transparency we also want to say that we have no commercial relationship with Tiger Sheds yet we do (via affiliate links) with others in this sector. We have attempted to do our best to make sure that this factor is not influencing the factual and objective way we are presenting the information below. Tiger Sheds are not actually a brand new company. They have been around as Tiger Sheds for around ten years now, but Tiger Box was what they were previously known as. They have a huge manufacturing plant based in Leeds which means that they can deliver all over the country. The first thing you have to look at when checking out a retailer is, of course, look at what kind of products they offer and we can tell you right away that Tiger Sheds have a very, very large selection of garden buildings. Their sheds section for example has wooden, metal and plastic sheds for you to look at. Their wooden shed is especially impressive with more subcategories than you can possibly imagine. Honestly, it is not an exaggeration to say that if it is a wooden shed you are looking for that Tiger Sheds will have one to the exact specifications that you want. No matter if it is a standard 8 x 8 or if you want something a little more precise with some fancy flooring and some kind of special roofing felt. We could have spent hours looking through their wooden sheds alone! While wooden sheds are clearly the specialty here, we were also very impressed with the amount of plastic and metal sheds that were on offer as well. 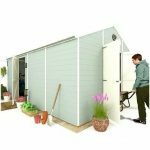 One of their range of products that we feel deserve special mention is their express sheds. Sometimes a garden building can take a while to be made and delivered. Express Sheds are designed with getting them to you as quick as possible, this is a great idea and one we do not think we have seen anywhere else. 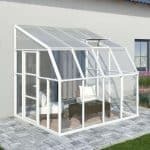 While garden sheds are great, but they also offer summerhouses, greenhouses, playhouses, pet houses and all kinds of accessories to make your shed extra awesome. With all this choice you may think that it is a little overwhelming, but this is not actually the case. They have main category tabs across the top of the screen and even a category like wooden sheds which has a ton of different subcategories is easy to navigate. Tiger Sheds understand that some folks want things as easy as possible, so if you want a standard 8 x 8 shed, you can click that sub tab and be taken to all those sheds. We think the fact that Tiger Sheds have their own manufacturing plant not only allows them to offer a wide range of sheds and other garden buildings, but it also allows them to deliver them much quicker. Plus we have seen some pretty cool designs here that nowhere else has. It is not an exaggeration to say that no matter what kind of garden building you want, Tiger Sheds will have it. Not only that, they will most likely have it in some kind of cool and clever configuration that will really impress you. It is one thing to have a ton of different products, but if your prices are way out of line what is the point? Tiger Sheds have managed to keep their prices right in line (and in some cases a fair bit cheaper) than some of the other garden building retailers thanks to their huge manufacturing plant. The fact that they make their own products means that they do not have to share their profits with another party. One other thing that we like about these guys is that they always have some kind of special sale or event going on. As we are writing this review it is right at the end of May 2018 and they are having a May Madness Sale. They always promote their sale and special offers on the homepage. With 12 products in this particular sale, we were impressed with the savings that they were offering. In terms of their other general products, the prices were very reasonable. For example, a basic 6 X 4 Overlap Shed can be had for a little over £200. What makes this a good deal is that Tiger Sheds do not use cheap materials like OSB board to keep the costs down. So while you could argue that somewhere like B&Q or Wickes may have a cheaper shed of the same size, their shed will be made with much cheaper materials. From the research that we have done, Tiger Sheds do not offer “cheap” sheds. They offer sheds and other garden buildings that are what we would class as good value for money. We feel that you are sometimes better spending a little extra up front to get a product that is going to give you more years of use. This rings true for all their products ranging from their sheds all the way to their high quality and high end summerhouses and log cabins. 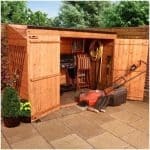 We know at first glance, you may think that Tiger Sheds are not as cheap as some of the other garden building retailers. However, we would ask you to look closely at what their sheds are made of and then you will see that the prices are actually very, very reasonable for what you are getting. Using a site to try and buy something should not require three degrees and an understanding of physics! However, some sites make it really hard to find what it is you are looking at. Thankfully, Tiger Sheds is not a site that does this. We already mentioned before that Tiger Sheds have their main tabs along the top of the screen with each one then having different subsections to let you get more specific. No matter if it is a shed, summerhouse, greenhouse or a playhouse you are looking for, with a little clicking around these tabs you will find what you are looking for. Another thing that we like on the home page is that when you scroll down they have their main deals and offers that are happening right now. As you scroll down the homepage you get to see some of their main items such as sheds and log cabins. Tiger Sheds do also have a quick search box at the top of the screen as well, we put a few different things in here like 10 X 10 shed, greenhouse, small playhouse and so on and the search results that we got actually fitted what we were looking for. So finding a product is easy, but what about when you click on one? If we look at their Tiger Shiplap Apex Shed you at first get a little bit of a description about the shed and then the main features of what makes that shed special. You then get to pick the size of the shed that you want and before you go to the buy section, you can decide to add some extras. From pro installation, glazed windows and shelving kits. Their extras section is not as overblown as some other retailers and that is something that we actually like. If you scroll further down you get the real meat and potatoes of the product. Tiger Sheds go into incredible depth about what makes a specific shed, summerhouse or whatever so good. We really like this. It means the people who just want quick and easy information have that, but those who really want to know every nook and cranny before they buy can get that information too. As far as using the site goes, Tiger Sheds do a good job in walking the fine line of offering a lot of information for those who want it. As well as giving those who just want the basics all the essential information. One cool thing that we found and we are not sure this is something that is done by many other retailers and that is allowing customers to add images. We think this is very cool and a good way for a potential customer to get an idea of what a product will look like in their garden. This was something we thought was really neat. 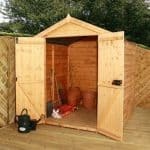 As well as adding reviews they have a separate section down at the bottom where you can see actual customer photos and get a better idea of what the shed, summerhouse or whatever will look like in your garden which is sometimes hard to do when a site only has stock photos of a garden building. When you leave a review on Tiger Sheds, you are given the option to also post your review on Trust Pilot. This is very interesting and again not something many other sites do, but it is something we think more sites should consider doing. Back in 2016 we went through 48 pages of reviews on the TigerSheds site and found 99% of them were 4 or 5 star reviews. This was in comparison to TrustPilot that had 76% of reviews between 4 and 5 starts and 24% with 3 starts or below. It’s now 2018 and from a cursory look at the onsite TigerSeds reviews it still looks like the same overly positive review ratios still apply. This is despite the TrustPilot score now hovering at the impressive level of 79%. We feel customers would have more trust in the onsite reviews on TigerSheds site if they used an independent platform like feefo (as Waltons do). With an impressive online reputation and a TrustPilot score of 79% for 4 to 5 star customer experiences, we feel TigerSheds clearly demonstrates many of its customers have a smooth hassle free experience and are satisfied with the products they buy. What Are The People Saying About Tiger Sheds? This is the section of the guide where we condense all the information we found online into one place. We have done our best to only make factual statements from the 3rd party sources and then we just share our opinion on those facts. The source list of sites we have used for this section are the websites that show up on the first page of google when we are searching for “Tiger Sheds Review”, we feel that doing things this way gives you are a fair reflection of what people are saying. One thing we have to say about reading customer reviews and this goes for pretty much anything not just Tiger Sheds: people are always more willing to take the time to write an angry one star review when something has gone wrong than take the time to write a positive review when everything has gone to plan. 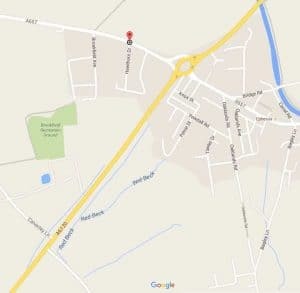 Also do not just look at five and one star reviews have a look at the middle of the road three star reviews as well. We have given you our thoughts on Tiger Sheds, shared with you what their customer reviews say on their own site, but now we are going to have a look at actual review sites where customers are free to post any kind of review they want. Now Tiger Sheds started as a fantastic company and in the early days had many, many five and four star reviews. As the company expanded they had to sail a few rocky waters, but they have gotten it back on track this year and their approval rating on sites such as Trust Pilot has reflected this. So we give Tiger Sheds a big ol’ high five for that. Trust Pilot: Trust Pilot has the most Tiger Sheds reviews online. As of us writing this review, Tiger Sheds has over 3500 reviews on Trust Pilot. Impressively 79 percent of them are 5 and 4 star reviews. When we last reviewed Tiger Sheds this number was 75 percent so they have clearly improved. A gentleman called Mark Caven had this to say about his experience “Everything from the initial ordering process, the price paid, communications over the past 11 days, the delivery process and then the final product was spot on!!!”. We had a good look at the reviews and the majority of people do appear to be very happy with their experience. There are of course some negative reviews where people have had issues with the quality of the sheds or the customer service they received. We made sure to read these and Tiger Sheds have responded to most of them and tried to make them right. We are not excusing these bad reviews at all, but when you have as many reviews as Tiger Sheds have there are always going to be some people who unfortunately have a negative experience. We do though feel that if you do have any issues, Tiger Sheds will do their best to work with you to make you as happy as you can be. Visit website and see reviews by clicking here. Review Centre: Over at Review Centre there are over 300 Tiger Sheds reviews and they currently have a 3.9 star rating overall. Over 300 of these reviews are for 5 and 4 stars with people very happy with not just the product, but the customer service too. One of the most recent reviews was left by a customer called, magoogy. “I was kept informed on delivery dates, which was 3 days for the shed to be delivered and it was installed 2 days later. The installer rang me to arrange installation at my convenience and was very polite and friendly. He and his young helper who came to put the shed up proved nice and friendly in person and had the shed up within the hour.” These positive vibes are shared by many customers on here. We do not just look at the glowing reviews so we made sure to have a look at the one, two and three star reviews as well. The main point of complaint for customers who have had a negative experience seems based on one or two things. First is the quality, to be fair when you are selling thousands and thousands of products, unfortunately, some “faulty” items are always going to sneak out of the factory. The other issue is customer service, more specifically getting hold of someone a Tiger Sheds. We know how frustrating it is when you are a customer and you need to have a back and forth with someone and it feels unnecessarily hard. Hopefully, this will be something that Tiger Sheds keep an eye on and strive to improve and from what we have seen it seems like they will. Visit website and see reviews by clicking here. Facebook: We think that Facebook and social media, in general, is a great way to get more information about a company. The Tiger Sheds Facebook page is pretty good in that they showcase many of their products, give information about special offers and they, of course, allow people to leave comments. It is not just the comments that we recommend you read, but also the way that Tiger Sheds respond to them. There is not a lot of “public” back and forth, but the little that there is shows that Tiger Sheds are willing to work with people. What we thought was pretty interesting is that when we went to the Tiger Sheds Facebook page, the little text box popped up and said that they usually respond in a couple of hours. So Facebook looks like it would be a very easy way to get hold of them if you were to have any issues. Visit website and see reviews by clicking here. Here at What Shed, we have looked at Tiger Sheds a few times and the very first time (which was many, many years ago now) they were kind of struggling a little bit in regards to keeping up with their expanding customer base and keeping their products top of the line and of course keeping in touch with customers. It does appear that they have managed to get things back on track. If we were reviewing the Tiger Sheds of 2012, we would probably have more than a few concerns. However, in 2018, Tiger Sheds have fixed many of the issues that they had and we really do not have any concerns going forward. Maybe they could be a little more clear on some of the customer reviews on their site if they are for that actual product or Tiger Sheds in general. In all honesty that is the only “issue” that we have and even then it is not a big one. Suggested Improvements: We have said numerous times in this Tiger Sheds review that we feel that they are on the right track. Not only are they on the right track, they are going full steam ahead. Tiger Sheds are one of the companies that have managed to find their footing in the world of garden buildings. Any concerns that we may have had have been dealt with and they have made other improvements such as making their site very well designed and trying their best to deal with customers who do have issues. Tiger Sheds is a fantastic garden buildings retailer. They have a great selection of products and we really like how they let you tinker with the designs in different ways. No matter what kind of product you are looking for be it a shed to keep your mower and tools in, a playhouse for the kids or a summerhouse where you can have a few cold ones after a hard day’s work. Tiger Sheds have something that will suit your style and your budget. They are pretty forthcoming so if you have any questions or queries about a product that you are interested in, get in touch. This review as all merchant reviews on this site are stand alone guides and are not indented to be used as a direct side by side comparison with other merchant on this site. Each of the different merchant reviews we do have common elements as a theme. However each one in individual and they are not designed to be used as a true side by side critical comparison. This is mainly due to the fact that it is hard to say accurately compare a company like Tiger Sheds with a large online retailer that sells sheds like say B&Q. We really think that Tiger Sheds have turned it around and are becoming a great retailer. But we would love to hear from you guys who have used them recently. Let us know how your experience was and we will be sure to keep it in mind when we update this page. Bought and paid for the shed on may 4th checked my bank account and they had taken out the payment twice. I rang to ask that the money be refunded the clown you speak to has a standard reply (you need to,put that in writing) he is no help whatsoever. It took 9 days to refund the money. When the shed arrived the sent felt for a 6×6 shed ordered an 8×6 again I rang again same reply put it in writing 4 days later [Name retracted] (whomis as much use as a chocolate teapot )send a me an email we need photo evidence to prove we have delivered the wrong Felt. Rang again to try to speak to him (he will not speak to customers). Ended up making a 24 mile trip to exchange the felt. The young man in the warehouse could not have been more helpful. Take note [Name retracted] and the clown who answers the phone. In my opinion you should avoid this company at all costs. I have had excellent service from this company. They delivered our shed 3 weeks before it was due and within the time slot given. Everything was included and shed was erected within 3 hours of delivery. The company is a jock. My brother waited ages for a shed and when he received it had holes in the wood panels, absolutely everywhere. The shed felt like paper. anywhere we touched while lifting up, it breaks. We also found out that the felt supplied does not cover the whole roof. So we had to improvise. When my brother questioned quality control, he was told, this is the customer’s responsibility to make sure that all in good order and this highlighted in terms & conditions, even though he did not see the terms and conditions because he made the order over the phone. Customer services is a joke, they asked for a review as soon as we had ordered it, and delivery is sooooo slow. go anywhere but here, they are slow, expensive and customer service would be a minus if I could. Extremely disappointing experience. Called up three weeks ago to get a delivery date, so that I could organise a chippy and Electrician for the date advised (28th) Received an email today to say that they have been urgently trying to get hold of me, no voice mail or missed call on my contact number. Called to confirm that the 1st is not acceptable, as I have already been informed it would be delivered on the 28th and had arranged installation for this weekend. I was informed that it was due to the delivery vehicle not being in the area. I tried to arrange collection, only for the story to be changed to that it was still in production. Web site is great, communication on initial order is great. Delivery system shocking and customer service experience extremely poor. I should have looked at trust pilot first. I would have gone elsewhere and would have probably had my shed by now too! Extremely poor service, not able to speak to a senior team members, as they are not in. I have serious concerns over your positive review of TigerSheds, specifically because you attach a lot of weight to their Trustpilot score. I submitted a negative review to Trustpilot, and later responded to their request for proof of purchase. The review was ultimately reject because it a) reviewed a product, not their service and b) it was over 12 months old. Firstly, when people are looking at Trustpilot scores of a company like TigerSheds, surely first and foremost they are expecting that score to be based on reviews about the product and quality of the product, not merely the service provided. Secondly, for something like a shed, a review over 12 months in age is without doubt more valuable than one younger because it will attest to the durability (or not) of the shed. On closer inspection it seems that TigerShed are engaged in an active cleansing of their Trustpilot reviews (many, many flagged reviews), which, since Trustpilot is funded by the companies it lists it happily assists with. Additionally, as a consumer, you are given a mere 7 days to give proof of purchase before a review is removed entirely. It’s lead me to conclude that Trustpilot reviews are far from unbiased and really not to be trusted. I hope you will consider this in your evaluation of TigerSheds (and indeed other companies). Bought a procas cabin, self assembly £3+. Erected over 4half days only problem double doors don’t fit/work. Customer “service” communicated for about 2 weeks then stopped. Even an e/mail to head of c/s goes unanswered. Stupid thing is, I only live 5miles from their manufacturing unit and I’m in the market for more units, so to sort out problem would not cost much. If you buy from this company and have a problem don’t expect any kind of aftercare. Contractors that came to fit were good, informative and polite. To the point that they pointed out problems that had been caused through delivery. Rang tiger shed and emailed many times for them regarding my concerns and sent photos to come and rectify mistakes. After passing the blame and not taking the word of the contractors maybe because the staff do not understand the construction of the shed and having been taught of how to pass the buck as of today still nothing has been done despite stating that a part would be delivered. Obviously not prepared to listen to public opinion. ‘order process was easy and staff spoken to were helpful. delivery slot and time was agreed and kept to. the delivery driver was particularly helpful. the log cabin was well packed and protected from the elements which given the weather was really good as it was 4 days until assembly. the instructions could be clearer as it took a while to understand the next step. the only criticism of quality was 2 parts were temporarily screwed together with about 6 screws. three of these had been screwed in such that the slots had become rounded making it impossible to remove with a screwdriver necessitating drill out out the heads. one window key is faulty! will ask for a replacement. Needing a new shed I researched the internet and looked at local products before deciding to go with Tigersheds. From ordering through delivery and construction everything was as hoped for and some more. I was a bit concerned about the possible lack of quality of the shed as the price was so much less than anything else I had looked but my doubts were quickly dispelled as soon as I took delivery. A very well made and sturdy shed with a proper wooden floor and roof rather than thinner OSB and putting it together was easy with a bit of family help and after only a few hours work I was ready to fill it. I must add, stupidly, I had managed to lose the fitting instructions but Tigersheds website has the instructions on it so that saved some embarrassment having to ask for more to be sent. All I can say is if I ever need another shed or someone asks me for a recommendation I must say Tigersheds is the place to go. Delivered before slot time and wedged shed between caravan and house. Delivery instructions were to knock on door and be given instructions around to the backs. I’m disabled and now have a shed where it can’t be used, can’t be carried through the house and to top it off its DAMAGED. CUSTOMER SERVICE COULDNT CARE LESS! Delivery service not so good – they didnt ring my doorbell or called mobile no. but just left the shed sections on a NEW – concrete base that was not not ready for load bearing. Instructions are vague, too small and generalised . They should be specific to each shed was not clear for a reverse pent shed. Due to the positive feedback I recently attempted a purchase from Tiger Sheds. Like other customers my shed was delivered well before the arrange time slot so we weren’t in, is this done on purpose? Nearly every piece of the shed had been damaged I presume by delivery, the wood is poor quality and splitting in a number of places, there was wood split by missed screws that were hanging out. 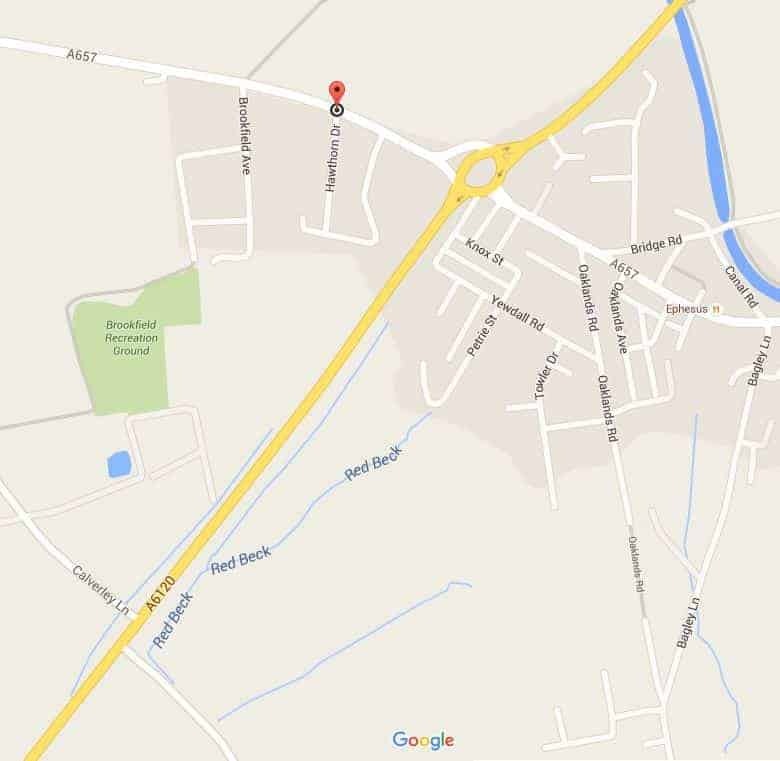 We have spent over a week in correspondence with their customer care and have now contacted trading standards. They are trying to charge ME 25% for the return of the faulty sub standard shed. They wanted me to wait another 8 days for someone to view the shed despite receiving photographic evidence. It had already taken 16 days from order to get it delivered – another week in correspondence then another week waiting for someone to view it. Unacceptable. I have now officially demanded a refund in full and will have to wait and see what happens next. I think you need to update your page as clearly Tiger Sheds haven’t learnt anything! Excellent shed, very well made, went together beautifully. And delivered on time! Tiger sheds was recommended to me and so I purchased a shed on line confident that I was dealing with a company that would provide a professional and good service. I needed the shed by a particular date and it arrived two days before. However, the shed arrived damaged. In short it had been loaded badly. The driver agreed that one panel was badly damaged. What then ensues is almost comical. I spoke to a company representative on the drivers mobile. The driver could not or would not send photos of the damage to his company. The company rep acknowledged that this was odd and he would deal with driver later. Consequently I sent the pics on my phone. I needed the shed and so could not return it given I had a crew on site to put up in the next two days. The company explained that I had two options. 1. They would send another piece. However this would not arrive in the required time frame. 2. If I refused to take the shed I would incur a 25% cancellation fee. It became evident that the Tiger sheds representative knew nothing about the Sale of Good Act, simply saying that if I do not take the item I would be charged 25% ! The fact that I was looking to return the item because it was damaged seemed irrelevant. All I wanted was a token amount given the item was damaged, it required repair and I did not have the time to wait for a replacement. Tiger sheds policy to adopt ‘blanket rules’ to every situation says it all. They don’t deal with individuals problems and offer solutions, they just deal with money. Disgusting. Next time I’d make the shed myself rather than line Tiger sheds pockets. If they are saying that if you decide you do not want to accept the order they will charge you a 25% cancellation fee. This seems to not be lawful according to advice given by Citizens Advice you can read here. I think if you are still in dispute you should contact Citizens Advice or Trading Standards to get clarification on this. I recently ordered a log effect 8×10 shed. I found the customer service and delivery exactly how i expected and delivered on a date that suited me. The shed went together with ease and I’m extremely pleased with the product. Overall I would recommend this company and highly recommend the quality of the products. Tiger Sheds have the worst customer service I have ever come across. We ordered a cabin 4×5 (The Zeta) under 2,5m. I was told on the telephone that the cabin would be 2.47m. The sales people were good and the cabin came really quickly and the delivery process was great. The cabin is great quality and I have no complaints there. HOWEVER the cabin is only 2.35m and the door doesn’t open because it gets stuck on the facia. Secondly the storm braces it came with which are fixed to the inside of the cabin don’t fit as they are too tall. I am dealing with [Name Retracted] in the customer service team who doesn’t take calls only communicates over email. At first he seemed very helpful however after a while it became clear they weren’t going to take any responsibility that it was too short. They gave me absolutely ZERO explanation why it was too short and when I notice the storm braces which was proof that the cabin was too short they had no rebuttal at all because they ARE to blame. They sent me the missing log and the 12 roof boards incase they split but they are not willing to send one of their builders to amend the building. They think they have done me a favour by sending the logs saying they weren’t needed! The instructions for the cabin say that it should be 18 logs high so it wasn’t that they were missing but that the design was wrong. My sister in law has a tiger shed and hers is 19 logs high on the short side. More proof it was one missing. My thoughts are that they have cheapened it and cut costs by making it shorter. I called to speak to [Name Retracted] but the girl who answered wouldn’t put me through. She also wouldn’t tell me the owners name or anything. Just the WORST customer service and rude. I would never recommend them and I am considering taking them to small claims as I have all the proof I need. After shopping around I decided to go with Tiger Sheds based on other buyers reviews. I was not disappointed. Everything was so easy from the initial ordering process online to assembly. My choice was an 8×6 Shiplap Apex shed. I also have to mention just how helpful the delivery driver was, nothing was a problem. I would highly recommend this company and can honestly say the product was much better that that offered by larger DIY stores and at a much more competitive price. No problems with communication from start to finish. Good competitive price. Shed ordered on 15th May for delivery on or about 12th June and delivered on 25th May which I could accommodate. Shed has a few small thin areas in the cladding boards. Overall, I am satisfied with this product. I placed an order for an 8×6 Tongue and Groove shed as I found it to be competitive price compared to other on-line companies. The initial delivery date was an estimate, but the delivery was made much earlier than this. I received a telephone call advising me of the delivery date and an approx time scale (am). The driver arrived on time and was most helpful even giving me a few tips on putting the shed up. Very upset. My son paid extra for “three days delivery”. Should have been brought on Monday but today is Wednesday and there is nothing. I lost two days at work. very upset.. Phone them few time a day and still got nothing. Would recommend to anyone, good price, good product and quality service from place of order right the way through to the helpful chap that delivered it. 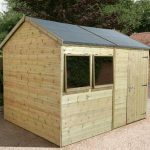 Excellent experience from start to finish – Clear instructions on when my shed would be delivered, very punctual and pleasant delivery driver. Can’t comment about after sales service as I haven’t needed it. Excellent Product-Delivery right on time and easily got it close to where it needed to be put up.not a lot of heavy lifting to put up. Hammer and a spanner for Coach Bolts all I needed to put up with an assistant to hold the panels up in place. Instructions clear and more than adequate fixings. Preservative purchased as option would recommend as one good coat with the 5 litres went well into the Shiplap panels. Tested shortly after wards with a downpour -rain just rain off Very Good-Would recommend to purchase and the no window option makes it a good security shed. Good quality easy assemble sheds at a reasonable price. Cannot comment on customer services as I did not have to contact them. The shed was delivered well within expected timescale. The delivery driver was extremely helpful and meticulous . The shed was easy to assemble and looks good. It is going to give many years of service. The shed has an excellent base and looks secure. I ordered a 6×8, price was fantastic, info given and details of deliver spot on. Driver was very helpful and friendly. The shed was a breeze to put up even with the slight downpour we had. ‘Really impressed with my shed – an 8×6 shiplap apex with upgrade to double doors. Delivery was much quicker than the predicted time. Instructions clear, easy to assemble. Very pleased with my 10×8 apex shiplap shed from Tiger. Good quality construction for a reasonable price. I opted for toughened glass windows and a glazing kit, so can’t comment on the standard perspex windows. Delivery was on time on the given delivery day. Assembly was surprisingly straightforward for what I consider to be a big shed. Two people required for some holding and lifting jobs, but mostly a one person job. The main structure (floors, walls, and roof) were up in an afternoon. Felting, nailing, screwing, glazing, treating, were completed on day two. Everything fitted together very nicely. No complaints. Brilliant. Second shed I have purchased , both great ,and the service form ordering to delivery, by a very pleasant and helpful driver , Thank you. Delivery slot was 0930 to 1130, arrived 0945, the shed was of good quality, better than all I had seen for this price. Fitted together well, three hours for two persons to assemble, I used screws instead of the provided nails. In all, a very good garden shed for the price paid, would recommend Tiger sheds to anyone buying a shed, very pleased with my purchase. Excellent product at reasonable price. Well built with good quality wood. Second shed from here and would use again. 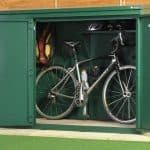 ‘I bought a 7 x 3 bicycle shed with shelf. Absolutely the best shed and the best service I have ever received. The shed is of exceptional quality and superbly made of the best timbers. Timber floor, not cheap chipboard. Delivery was prompt and the driver was extremely helpful. Everything arrived in superb condition and dry. I wish I had bought my summer house from Tiger Sheds. I would not be nearly as disappointed with it. I was very happy with my 8×6 Pent Shed and the delivery time from Tiger Sheds including delivery time and a very helpfull driver. so much better than the big DIY shops. the quality for the price is very good. Nice and quality shed, easy to put together. Would definitely recommend to others! Good quality at competitive prices and a great service!! very happy with this firm, being wary after buying a shed from another firm which proved not fit for the money (took me 3 years to get a full refund with them) i was cautious about another shed. The whole process was easy from start to finish and as i bought during the sale i got a really good price on it. I chose the 8 x 6 Tiger Flex Apex™ Windowless Shed with pro installation. I was kept informed on delivery dates, which was 3 days for the shed to be delivered and it was installed 2 days later. The installer (dave) rang me to arrange installation at my convenience and was very polite and friendly. He and his young helper who came to put the shed up proved nice and friendly in person and had the shed up within the hour. The shed is a nice, sturdy build and looks like it will last me many years to come – its very well built and really strongly made. I opted for the windowless one with high roof and i was allowed to choose where to place the door. It looks lovely up and blends in really nicely in my garden. Thank you ever so much for making my experience a good one, after being bitten once by a badly made shed im so glad ive now found a company who make lovely, well made sheds – im sure i will be buying other items from them. Worst experience possible. Dangerously top-heavy and unstable consignment, inadequately secured and full of exposed staples, nails and screws. I was badly injured trying to unpack it, despite constructing a framework of props to support it. Nasty cheap thin white wood, slapped with tomato-soup coloured “preservative”. Splits, splintered parts, flimsy panels, no integral strength. Quantities delivered don’t match list provided and seem to come from different shed. Instructions are dreadful and frankly should be ignored. Calls to Tiger sheds for technical assistance met with morons who “worked in the office” and have never built a shed. Caught with their pants down, they resorted to blaming the poor delivery driver, then to personal abuse – the inevitable refuge of someone who is exposed as grossly incompetent. My advice to you: DON’T BUY ANYTHING FROM TIGER SHEDS. Don’t buy from this company if you need delivery by a specific date. On the day that I was going to place the order for the cabin I called their sales dept to check the lead time for the cabin that I wanted as I had booked a week off to build it. This was 9 weeks before I was planning to take the week off and I was told by the sales dept that the lead time was about 6 weeks so should be no problem. I went ahead and placed the order, but stated in the comments section of the order form the date that I needed it by, same as I had told the sales dept. I have now received an email with a delivery date that is 10 days later …. so 10 weeks since ordering, not the 6 that I had been told. When I called to query this I was told “we don’t guarantee delivery dates” so there was nothing that they could do. Also, if I wanted to cancel the order because of the late delivery they would charge 25% of the order value which in this case is over £500. I am now trying to re-arrange time off from work and school holiday childcare arrangements to fit in with their late delivery. Just beware that even if you call Tiger Sheds and they quote you a lead time for delivery, you can’t rely on it, so don’t order from them unless you don’t care about when it will turn up! Bought shed 12 months ago stained twice 6 weeks ago wood bowed got in touch with tiger sheds blamed me if you want to buy a new shed every 12 months by off them . Bought a 6×8 apex shed from them in September 2017. Went up quickly and easily and was very impressed with the quality so bought a 10×6 pent swell in October 2017. It’s now December ’18 and despite the worse snow for 30 years and numerous 80mph winds over the past 15 months, both sheds sit exactly where they were placed in perfect condition. I modified my sheds when building to use coach bolts rather than screws and also generously coated the underside of the floor and top of the roof with ‘creocote’. I’m in the market for a log cabin early in 2019, and will look to Tiger sheds first.